Barn Owl Cottage in Otterburn, near Bellingham, Northumberland sleeps 6 people. Barn Owl Cottage near Bellingham has a lovely private hot tub at the side of the lodge on the raised decked area, with plenty of seating for six people to relax and watch the stars. This modern designed, detached lodge is ideal for couples; friends to get together to celebrate that special occasion, or to have a lovely family break. 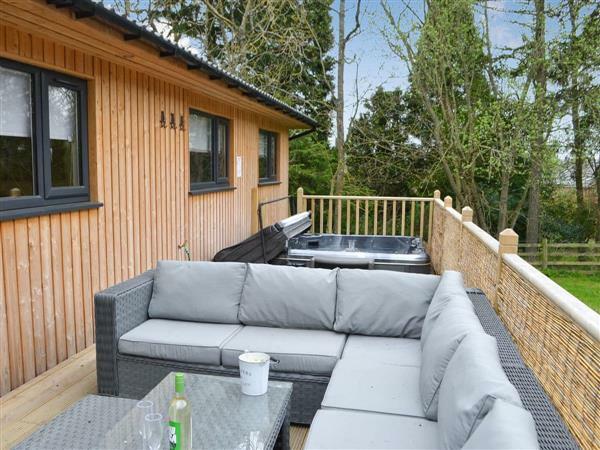 This is an ideal location for your mini break or family holiday, set amongst other holiday lodges just within the National Park boundary, so that you can explore all corners of this vast and friendly county. If you don’t feel like cooking, the on-site restaurant offers great quality food with a small bar, and it is only 300 yards away. The local inn is only ¾ mile, where you can meet friendly local people should you decide to venture down to the village. The village store is only a mile away and has a great range of daily essentials with wines and spirits, and is open till late every day. However, only 9 miles away is Bellingham with a large supermarket, butchers, bakery, pharmacy, post office, pubs and cafés. Whilst in the area, visitors love to visit the Kielder Observatory (booking essential in advance), ideal for amateur and professional astronomers, and is set in the International Dark Sky, the largest in Europe. Otterburn allows easy access over to the stunning Northumbrian Heritage Coast, another Area of Outstanding Natural Beauty, and really worth a day trip to discover the castles and coastal villages which go all the way to Berwick-upon-Tweed. However, should you fancy some culture and entertainment, Newcastle-upon-Tyne is only 32 miles away, with great architecture, vibrant quayside, glorious shops, abundance of pubs and restaurants and of course the famous Tyne Bridge. Hexham with its abbey, shops and culture is around 25 miles away. The shop is 1 mile from Barn Owl Cottage near Bellingham, with the pub ¾ mile, and the restaurant is 300 yards from Barn Owl Cottage. Open plan living space: With Kardean floor. Living area: With 55 Freeview TV with Netflix and French door leading to decking. Electric central heating, electricity, bed linen, towels and Wi-Fi included. Travel cot and highchair available on request. Sitting-out area with garden furniture. Grounds (shared with other properties on-site). Hot tub for 6 (private). Private parking for 2 cars. No smoking. Please note: The property has a natural water supply from a spring. Holidays at Barn Owl Cottage run from Monday to Monday. Barn Owl Cottage is in Northumberland; should you be on the lookout for a special offer, you can find all the special offers in Northumberland. It's always worth checking to see what is on offer at the moment. Do you want to holiday near Barn Owl Cottage (UKC3399), you can see other cottages within 25 miles of Barn Owl Cottage; have a look to find your perfect holiday location.